Looking to give your skin some extra love? 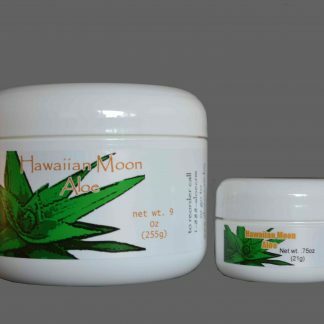 Our Hawaiian Moon Aloe vera skin cream is an excellent all-around moisturizer. It penetrates your skin 7 layers deep, hydrating from the very basal layer of your skin. 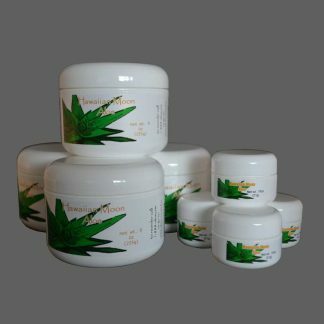 Because it’s a great moisturizer, it can improve skin conditions ranging from ashy skin, generally dry skin, chapped skin, cracked hands, itchy skin, rosacea, eczema, psoriasis, and more. Our Hawaiian Moon Aloe vera skin cream also works great on other ailments! Things like abrasions, bee stings, bruises, burns, chapped skin, healing cuts, diaper rash on your babies, insect bites, and even itchy skin. It is not only an excellent moisturizer, it helps you recover from nasty sunburns whenever you’ve forgotten your sun screen. 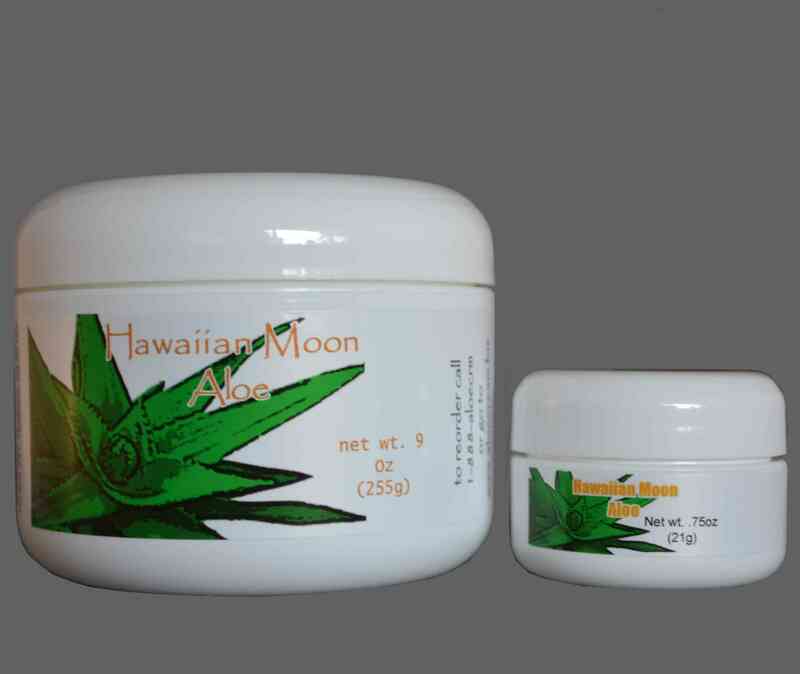 This is for a 9 oz jar of Hawaiian Moon Aloe vera skin cream plus a free .75 oz jar of the same for traveling. This amount will typically last 4-6 months, depending on your usage. Looking for a larger quantity? Try our Family Pack Special – this is 4x this amount, and you’ll save in the process! I can’t believe no one has reviewed this product. I have been using this for almost two years and can’t live without it. It is the most wonderful moisturizer, I use it morning and night and it really protects during the cold winter months. Great product, absorbs well and the large jar lasts a really long time! Rosacea sufferers, this is a wonderful product! Will take away redness and itching!!! Please try! 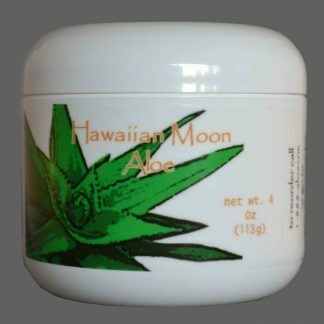 Thank you so much Hawaiian Moon Aloe! I feel guilty of not writing reviews so often but this product really deserves one! I was introduced to Hawaiian Moon Aloe in a sleep conference expo in Seattle and I felt so in love with it that I ordered in the spot. I have been using this cream almost every day and the dryness of my skin is gone, it’s like magical. 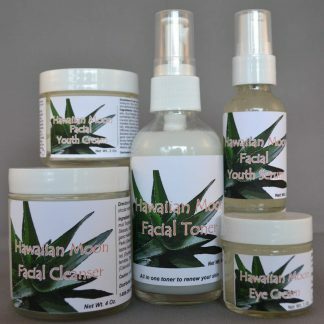 My 2 teens started developing some acne and I put cream on them and within one week, the acne has decreased about 90 %. Believe me that your money is totally worthy on buying this product. I first bought the product at the Hinman Dental Convention 2016. I loved it and shared with my mom (who took the rest of my jar and told me to myself another one lol). I bought another set at the convention this year and got one for my mom. I usually use it on my hands and only need to apply it just one more time after I apply it in the morning. I recently started using it on my face and my acne scar is mostly gone and my skin felt never better. I will be using this as my regular product now. Little bit goes a long way for this product. If you see this at a show, definitely get it then because you get more discount. I am 72 years old. I have tried dozens of facial products over the years, and never found one to make any difference whatsoever, no matter the cost (and some were very costly). I encountered this product at a trade show for Bloomsday, 2017 in Spokane, WA and the sample at the show felt good and the price was right and I was desperate, so I bought it. Can’t believe I’m saying this: for me this product is a miracle. Almost immediately my skin felt softer & smoother and wrinkles started to fade. Yes, of course I still have wrinkles, but the ugly creases around my mouth don’t look so ugly & deep, and others really do seem to have gone away. and, the 9 oz container lasts a very long time. It even has helped the shadows under my eyes, and a bonus is that it does not irritate my eyes, which are very sensitive. I have kidney cancer and the treatment pills I take (Votrient) cause callouses on the bottom of my feet at all pressure points: every toe, the heel and the ball of both feet. Vinegar soaks and Urea cream help to lesson the callouses, but I needed something that would help the skin to heal and make it softer. This stuff works!! It is awesome. I met this cream in Washington Square kiosk when I visited in Portland in Dec. 2018. I think that it is amazing moisturizing cream which I’ve never seen. Every winter season, I suffered from itching of drying skin and worried about a red face. This cream has become my perfect solution.